GOLDTHWAIT, BENJAMIN, military officer; b. in Boston, Massachusetts, 25 Nov. 1704 (o.s. ), son of John Goldthwait and Sarah Hopkins; m. 10 Oct. 1726 to Charity Edwards; d. 10 May 1761. Benjamin Goldthwait began his varied career as a saddler and then a chaise-maker. 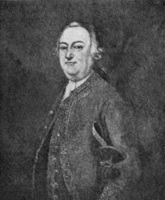 He was first elected to civic office in 1735 when he was sworn in as a town constable of Boston; in 1742–43 he held the office of clerk of the market. When the government of Massachusetts decided to launch an expedition against Louisbourg, Île Royale (Cape Breton Island), Goldthwait enlisted and on 9 Feb. 1744/45 was commissioned a captain in Samuel Waldo’s 2nd Massachusetts Regiment. He was placed in command of the 4th Company and served in that capacity during the siege of Louisbourg. By 1746 he had been appointed commissary agent for Waldo’s regiment, a position he held for at least two years. In the fall of 1746 Goldthwait was sent to Annapolis Royal as part of a New England reinforcement for Nova Scotia. That winter the New Englanders were dispatched to the Minas area under the command of Arthur Noble, in an attempt to rout the French forces in that region. Goldthwait was present at Grand Pré on 31 Jan. 1746/47 when the French launched a surprise attack against the New England forces. On the death of Noble, Goldthwait assumed command of the troops, but seeing the hopelessness of their situation, he agreed to surrender to the French commander, Nicolas-Antoine Coulon de Villiers, and formal terms of capitulation were drawn up and signed. Goldthwait then returned with his men to Annapolis Royal, where he apparently remained as a company commander until 1748. In 1755 Goldthwait was once again on active service, as a major in the company raised by Colonel John Winslow* to attack Fort Beauséjour (near Sackville, N.B.). He was an active participant in the siege of that fort and was present at the council of 16 June 1755 which deliberated on the terms of surrender. He later assisted in the deportation of Acadians from the Chignecto region to the American colonies. In 1756–57 Goldthwait was actively engaged in military service in Massachusetts and New York and in 1758 he served as a major in the second Louisbourg expedition. He died in Medford, Massachusetts, in 1761; he was declared insolvent, and his estate was divided among his creditors. He had at least five children. AN, Col., C11A, 87, ff.314–61; C11D, 8, ff.130–34. BM, Add. mss, 19071. Mass., Archives, Military records, 73, f.474; 75, ff.405–6; 77, ff.52–53. Mass. Hist. Soc., Winslow papers, 61.E1.88; 61.E1.103; 61.E2.9. PAC, MG 18, F10. PANS, RG 1, 13, nos.38, 39; 13 1/2, nos.19, 23, 24; 357, pp.1–247 (Winslow’s journal at Beauséjour; printed in N.S. Hist. Soc. Coll., IV (1884), 113–246; see especially pp.119, 124, 137, 143, 157). Boston, Registry Dept., Records (Whitmore et al. ), , . Boston Evening-Post, February, March 1747. Charlotte Goldthwaite, Goldthwaite genealogy: descendants of Thomas Goldthwaite, an early settler of Salem, Mass. . . . (Hartford, Conn., 1899), 78–81. New Eng. Hist. and Geneal. Register, XXIV (1870), 370; XXV (1871), 253. Barry M. Moody, “GOLDTHWAIT, BENJAMIN,” in Dictionary of Canadian Biography, vol. 3, University of Toronto/Université Laval, 2003–, accessed April 22, 2019, http://www.biographi.ca/en/bio/goldthwait_benjamin_3E.html.